"The religious literature cannot be understood without some sympathy for the outlook of its authors. But this is exactly what modern scholars have found most difficult. (...) The rationalistic and slightly contemptuous objectivity of the traditional Orientalist can no longer be upheld in this field." - Clark, 1959, pp.12-13. "Un égyptologue qui ne croit pas à la religion égyptienne, que ne partage pas une sympathie totale avec la civilisation qu'il étudie, ne saurait, à notre avis, que prononcer des paroles déssechées. L'intellectualisme, si brilliant soit-il, n'a jamais remplacé le sentiment vécu, même dans une discipline scientifique." - Jacq, 1983, p.7. 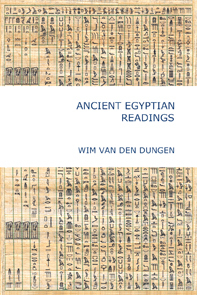 As soon as scientists were able to read Egyptian with a high degree of probability (i.e. more or less decipher hieroglyphs adequately) and this hand in hand with a considerable improvement in their archaeological research methodology, contemporary Egyptology and its adjacent sciences were able to come closer to the Egypt of history, as distinct from Hellenocentric, religious or esoteric prejudices concerning this formidable civilization. Indeed, out of over 110.000 objects in the British Museum's representative collection of Egyptian antiquities, about a third are inscribed with a text in some manner. This does not reflect the museum's bias towards inscribed materials, for in Egypt even mud-bricks could be stamped with texts. "Perhaps more than anything else, the material from the village hints at a vast oral and aural literary tradition of which only a tiny proportion has been preserved." - Wilson, 2003, p.93. Since the birth of written Egyptian around 3000 BCE if not earlier, writing and élite cultural productions had always been intimately linked. So powerful was the "heka" (magic) of the written word, that its presence alone was believed to make the expressed thought a future reality. Thanks to more precise and disciplined archaeological investigations (attempting also to recover the social history of ordinary individuals), the important religious, sapiental and spiritual components of a provisional but consensual picture of Ancient Egyptian history emerged. This we propose to identify and discuss in a way reflected by Egypt's literature, monumental record and popular religiosity. "... modern egyptology is essentially nothing other than the triumph of antiquarianism over the image of Egypt that had been operative for so long in the cultural memory of the west. The fascination with hieroglyphics, the 'deistic' quest for a natural religion - both were now jettisoned as a huge misunderstanding." - Assmann, 2002, pp.432-433. The rediscovery of Egypt at the end of the eighteenth century (Bonaparte's expedition to Egypt of 1798), especially the "cracking" of the code of the Egyptian language by Jean François Champollion (1790 - 1832, cf. 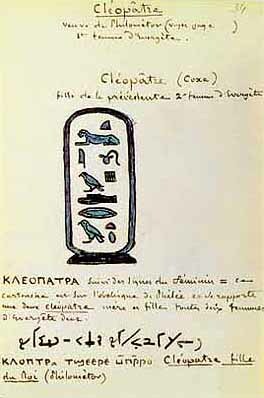 Précis du système hiéroglyphique des anciens égyptiens par M.Champollion le jeune, 1824), heralded the end of the "allegoric interpretation" of hieroglyphs which had dominated pre-Napoleonic egyptology. The Late Hellenistic "reading" proved to be wrong. inscribed on an obelisk found at Philae by Belzoni. Indeed, from the Renaissance on, attempts at decipherment had entailed a process of explaining the esoteric, allegorical, metaphorical, analogical, hidden ("mystical") significance of hieroglyphs. The greatest stumbling-block in the way of discovering the phonetics of hieroglyphs was the general confusion about the script at the end of its historical use (on the island of Philae in 394 CE). Authors like Diodorus Siculus, Chaeremon and Horapollo, an Egyptian of the fifth century CE, all affirmed hieroglyphs were not phonetical but allegorical. The Renaissance took this view for granted. However, it was the Egyptian priests of the Late Period who had initiated this confusion by introducing secret, esoteric and cryptographic inscriptions, but this time without mentioning the usual normal hieroglyphic text. Indeed, in the Middle Kingdom and even before, when in ornamental dedications, the figures and emblems of the gods had been used allegorically, they had been usually accompanied by transcriptions of the cryptic text in standard hieroglyphs (Wilkinson, 2000, p.46). This introduction of extra hieroglyphs into the writing system, swelling the number of signs, made a text in basic Middle Egyptian grammar unreadable to someone trained in Middle Egyptian only. Ptolemaic hieroglyphs (top) transcribed into Middle Egyptian (bottem). he stands in the sky opposite it (the temple) every day." Moreover, these native priests, very anxious to safeguard their mysteries against Hellenism, also used cryptic variants of normal hieroglyphs. As a result, the number of signs exploded (from the normal 700 to over 6000) and some writings became increasingly unreadable and accessible only to a limited number of dwindling priests. They alone detained the keys enabling one to read this rather symbolical, indeed allegorical script. "From antiquity down to the end of the eighteenth century, there was a dominant, ideal picture of a Hermetic-Hellenistic Egypt that had its influence on nearly all educated people ; the Renaissance, with its strong Egyptian component, was a rebirth of late antiquity, not of the classical period." - Hornung, 2001, p.199. Although the learned and meritorious Jesuit antiquarian Athanasius Kircher (1602 - 1680), attracted derision and proposed nonsensical allegorical translations (Lingua Aegyptical restituta, 1643), he did stimulate matters Egyptian. But even Thomas Young (1773 -1829), author of the undulatory theory of light, who had assigned the correct phonetical values to five hieroglyphic signs, still maintained these alphabetical signs were written together with allegorical signs, which, according to him, still formed the bulk. 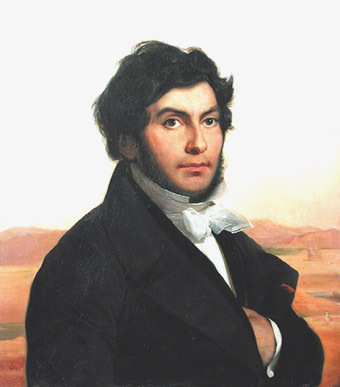 Champollion, who had a very good knowledge of Coptic (the last stage of Egyptian), proved the assumption of the allegorists wrong. He showed (assisted by the so-called "Rosetta Stone") that Egyptian (as in any other language) assigned phonetical values to signs, forming consonantal structures as in Hebrew and Arabic. He also discovered some were pictures indicating the category of the preceding words, the so-called "determinatives". After Champollion's death in 1832, the lead in egyptology passed to Germany (Richard Lepsius, 1810 - 1884). This Berlin school shaped Egyptian philology for the nineteenth and twentieth centuries, in particular scholars such as Adolf Erman (1854 - 1937), Kurt Sethe (1869 - 1934), who, together with Francis Griffith (1862 - 1934), Battiscombe Gunn (1883 - 1950) and Alan Gardiner (1879 - 1963) in England, laid the systematic basis for the study of Egyptian. Later, Jacob Polotsky (1905 -1991) established the "standard theory" of Egyptian grammar. These efforts made the historical record finally available to scholars of other disciplines. The contemporary publications of the Dead Sea Scrolls (example : Temple Scroll), the Hermetic texts found in the Nag Hammadi library (example : Discourse on the Eighth & the Ninth), the Didache, Q1 and the Coptic Gospel of Thomas (to name a few significant texts), as well as the work of the Jesus Seminar, allowed to come closer to the historical truth about Mediterranean spirituality as a whole, and in particular, to understand the difference between "Antiquity" (in Egypt, ca. 3000 BCE - 664 BCE) and "Hellenism" (Ptolemaic Empire, from 332 BCE - 30 BCE), the latter being the usurper and reorganizer of the former in the name of a higher mode of cognitive functioning : Classical Greek reason (so-called "concept-realism"). In that sense, the true meaning of Antiquity as well as Late Hellenistic spirituality has not yet dawned or is just about to. To assist in this rebirth is part of my intent. Egyptian religion, the heart of this grand and enduring civilization, was centered around divine kingship and its ceremonial activity. At its service was an intellectual class (architects, administrators, high priests, top craftsmen, scribes) who had the leisure to persue sapiental inclinations and ask themselves the great questions of life. Especially in the IVth Dynasty of the Old Kingdom (ca. 2600 - 2487 BCE), the master canon was devised (by Imhotep). It defined the specific forms, proportions and systematic organizations of all relevant elements of art, architecture & writing, each element being part of a basically unified plan, which existed to confirm the rule of Pharaoh as well as the king's divine origination. Great advances in writing took place, and less and 150 years later, Pharaoh Wenis (Unas or Unis) was the first to adorn the antechamber and burial-chamber of his underground tomb with hieroglyphs. These texts relate the fundamentals of Heliopolitan and Osirian theologies : Pharaoh resurrected as Osiris and ascended to heaven (the circumpolar stars) to eat the gods and exist as an Akh (or light-spirit) with Re. To unfold this level of sophistication, this master canon must have been worked at for at least five centuries. This "archaic" canonical system, incipient in Early Dynastic Egypt, endured untill the end (i.e. never was completely lost and always returned to define kingship and divine rule). Biblical & Koranic prejudices : the monotheist religions "of the book" have collectively demonized Pharaoh (the great crocodile who claimed to be a god) and are also partly responsible for the sapiental aura around Egyptian civilization. Nevertheless, their views remained largely unfounded. By and large, the narrative is intended to show one's supposed superiority over Egyptian culture. In 1 Kings, we read : "Solomon was wiser than the wise men of the East or the wise men of Egypt." (4:30), whereas in Exodus, affirms : "... the King called for his wise men and magicians, and by their magic they did the same thing." (7:11). In Matthew (2:13-15) we learn that Jesus escaped to Egypt (to the Alexandria of Philo Judaeus ?). In the Koran (12:49), the fertility of Egypt is said to be caused by "rain", showing that its author was apparently unaware of the fundamental reason for Egypt's perennial prosperity, namely the yearly inundation of the Nile ! Moreover, the sister of Moses is identified with the mother of Jesus. Hermetical prejudice : as soon as Ionian and Carian mercenaries who served in the army of Pharaoh Psammetichus I (664 - 610 BCE), were followed by ordinary travellers, the Greeks discovered Egypt and were impressed by its culture. These Ionian Greeks were hungry for knowledge, and, as shown elsewhere, were influenced by Egyptian theology & sapiental teachings. The first observant visitors who wrote about Egypt were Hecataeus of Miletus (ca. 510 BCE) and Herodotus of Halicarnassus (ca. 484 - 430 BCE). A lot of what both wrote contained a kenel of truth, but this was presented in a distored & exaggerated format. Herodotus was obsessed with the idea that the Hellenes derived from Egypt !! With the establishment of Greek supremacy under the Ptolemies, traditional Egyptian lore was withdrawn into the hands of the priesthood, who over-emphasized the profound wisdom & ritualism of their ancestors and made the hieroglyphic signary explode, to convey their special(ized) spiritual knowledge (from fewer than 1000 in the Middle Kingdom to over 6000 signs covering the walls of Graeco-Roman temples). Egyptian Antiquity was recast by Hellenism (the same had happened to the Jewish people after the Babylonian Exile). Around 150 BCE, this confrontation between Egyptian religion (in its Late Period) and Greek culture, produced Alexandrian Hermetism, a kind of Alexandrian lodge or communal wisdom-teaching (cast in a religious format with adjacent magical practices). These Hermetics were small fish in the emergence of the vast network of cultural interactions which had opened up since Alexander the Great and the advent of the Ptolemaic Empire. Hermetism was most likely an Alexandrian "gnostic" wisdom lodge, composed out of intellectual Greeks and Egyptians, persuing the teaching of Hermes or Thoth. These dialogues were written down in Greek and had authorative command. From the time of Julius Caesar, we have longer accounts about Egypt and its language, such as the General History of Diodorus Siculus, who visited Egypt briefly ca. 59 BCE, the Geographica of Strabo of Pontus, who accompanied the prefect Gallus on an expedition as far as the First Cataract (ca. 24 - 25 CE), the Historia Naturalis of Pliny the Elder (23 - 79 CE) and the Geography of astrologer & astronomer Claudius Ptolemaeus about 150 CE. Since the Renaissance, Egyptian culture got identified with its Hellenistic adaptations, in particular with Alexandrian Hermetism, with its division in "learned" (philosophy) and "vulgar" (occultism), in philosophical and technical Hermetica. Hermetism was partly assimilated by Islam (through Harran and Sufism) and, in the West, was integrated in the "Orientale Lumen", which, in the XIIth century, animated Christian Cistercian spirituality (cf. Bernardus of Clairvaux, William of St.Thierry, etc) and alchemy. Hellenocentric prejudice : although the "ad fontes" principle of the Renaissance claimed to focus on the Classical Period, it was indeed a return to Late Antiquity. Most classical philologists had (and have) a preference for the (rational) Greek way of thinking and were thus unable to understand the (ante-rational) patterns of thought of the Ancient Egyptians. Moreover, they were not equipped to study human cognition as such (which is the task of epistemology). Nor could they gain from comparative studies on the neurological conditions of human cognition, with its rational, emotional and instinctual levels. The negative side of these inadequacies still thrives in closed, phobic and modernist academic circles today. It is responsible for an intellectual misconception of Ancient Egyptian civilization, born out of lingering Europacentrism (called "Humanism") as well as an atheist positivism blind to the essence : the role of divine Pharaoh and the existence of the Pantheon. Because of this, the direct influence of Egyptian thought on Greek philosophy and culture (as well as on Christianity, in which it got partly integrated), has not yet been fully noticed and explored. Although the "out of Africa" hypothesis is indeed too extreme, the co-formative influence of Egyptian civilization (even more so than Mesopotamia) on the formation of Judaism, Graeco-Roman culture and Early Christianity is unmistaken and studied here. Atheist prejudice : in contemporary Western centres of higher learning, materialism and atheism, the former's adjacent probable, are, although built on outdated objectivistic epistemologies, nevertheless fashionable. Because everything is deemed material, i.e. aggregates of physical particles, waves, fields and their natural forces, traditional concepts as "spirit", "soul", "mind" and "consciousness" (and their adjacent cultures) are reduced to epi-phenomena of physical processes (physicalism). The mind is not processed or computed by the brain, but produced by it. Religion is not the expression of the Divine, but a superstructure enabling the higher classes to oppress the workers (Marxism), the projection of a fear (Feuerbach) or a sublimation of instinctual drives (Freud). Hence, both the Divine and the afterlife are rejected as primitive visions, resulting from a lack of knowledge of the underlying physical causes. Matter and the physical universe have no purpose (cf. "telos", "causa finalis" or final cause : the end for which a thing is done). Evolution is thus random and intelligent design rejected. Mathematicians have called this the replacement of the "miracle of God" by the "miracle of numbers", for the calculated probability of evolution being random is extremely small (cf. the weak anthropic principle in cosmology). In egyptology, this atheist mentality is disastrous, for no other great civilization of Antiquity was more occupied with the Divine and the afterlife than the Egyptians. Although egyptology deems every thing Egyptian interesting, there is nothing more interesting in Ancient Egyptian studies than the deities (their religion, ritual & magic) and the afterlife. Methodologically however, atheism works as a blocking device, especially if faith in the Divine is considered silly, and that of the "primitive" Ancient Egyptians even more so. Agnosticism seems therefore the best methodological answer. The critical attitude (not dogmatic and not sceptic) does not deny the possible existence of the Divine, albeit as gods and goddesses, but postpones its judgement regarding this matter. It accepts the possibility, but does not fill it in. This openness to possibilities remains always opposed to the fashionable show-down of the religiosity of the Ancient Egyptians. Atheist are sceptics, i.e. dogmatic thinkers in disguise, for by affirming the negative, they position (by reversal) their dogma. In the second half of the XIXth century, a history of the development of the Ancient Egyptian mind was deemed impossible (Burckhardt, 1868). Even for the fine flowers of egyptology, Egypt remained alien and remote. But today, technological advances, linguistic discoveries, epistemological studies, new translations, as well as detailed archaeological research, enable the historian of thought to grasp this difficult subject-matter less tentatively, although a complete, detailed picture is still lacking, and will probably ever be. Nevertheless, more can be known about the Old Kingdom than about the Archaic Greeks. Three decades ago, genetico-cognitive sciences made it clear that the level of thought in African environments does not overcome concrete operational thinking. I.e. as a whole, African cognitive culture never included abstract, discursive propositional operations or theoretical, decontextualized thought (Bovet & Othenin-Girard, 1970). Genetical epistemology, initiated by Piaget (1970), puts into evidence three ante-rational modes of cognition. Here they are called : the mythical, the pre-rational and the proto-rational modes of cognition. Also consult : Towards a Cybernetical Anthropology, 1993 (in Dutch), On the Brainmind, 2003, Criticosynthesis, 2008, Metaphysics, 2012 and Book of Lemmas, 2014. An essential feature of ante-rational thought, is the layeredness of its modes, i.e. the absence of a radical denial (pre-rationality rejecting myth, proto-rationality rejecting pre-rationality and/or myth) hand in hand with the omnipresence of multiple approaches & meanings. Strata emerge : upon the original, mythical layer, a new, pre-rational one is made to rest. Why ? Because the tensions in the mythical layer were insufficiently harbored by myth, causing conflicts (disequilibrations) and thus the need to re-equilibrate on a "higher" level of cognitive organization (in order to survive), i.e. develop pre-rationality. Then, in this pre-rational mode, new conflicts arise, triggering the formation of yet another level : proto-rational thought. The latter has the capacity to think stable, concrete thoughts, although devoid of abstraction and always contextualized. Because of this new operational capacity of thought, ante-rationality is brought to a concrete, practical "mental closure". Ancient Egyptian civilization is the best example of an enduring proto-rational closure, a concrete master plan which defined Antiquity as a whole. Our understanding of the history of ideas in Ancient Egypt is much helped by these epistemological distinctions, allowing us to trace the universal logical characteristics of the early modes of human thought in the available historical record. They also help us to avoid the sterile confrontation between, on the one hand, those scholars who claim the Ancient Egyptians could not think (read : knew no abstracts), and, on the other hand, those who are puzzled by the complexity of their cognitive, verbal representations, due to the bizarre mixture proposed by a proto-rationality, comforting both myth and pre-rational thought, i.e. a pragmatical, contextualized "system" of concrete concepts. Furthermore, a reasonable understanding of structure, contents & process of ante-rational thought makes the study of the emergence of rational thought (in Greece) more easy. Finally, in terms of an implicit, perennial "semitical" tradition, understanding Ancient Egyptian ante-rationality, allows us to actualize the antiquity of some contemporary religious norms, values and expectations. Recent studies confirm what some distinguished egyptologists conjectured, namely Predynastic Egypt gave birth to the earliest myths. As the record is sparse, only loose conjecture is possible. We know that the Neolithic "great goddess" was of prime importance, as was the emergence of divine kingship (between 3100 and 3000 BCE). The latter implied the assimilation of the power of the goddess by the male king (Hassan, 1992). This was deemed "one of the most extraordinary intellectual achievements of Egypt's first kings" (Wilkinson, 1999, p.185). Mythical thought received a pre-rational, Pharaonic superstructure. With this pre-concept of a dual monarchy, the union of two halves, Predynastic mythical thinking was replaced by Early Dynastic pre-rationality and the paired contrasts embraced by a totality, a harmony of opposites, realized in kingship and the Pharaonic state. Pharaoh was given "transcendent significance" (Frankfort, 1948). In the Old Kingdom, this function became omnipotent, and in the IVth Dynasty, Pharaoh was the only god alive on earth (as the son of his celestial father Re). Also in the Old Kingdom, writing developed dramatically, and various "theologies" saw the light (Osiris, Ptah, Re, Thoth and later Amun). The tensions between them were not resolved, for no cognitive tools were available to do so. On a pre-rational level, the soteriology offered by Heliopolitan "royal" theology was in conflict with the popular Osirian cult. Although an (inter) subjective dimension was present (namely a person's relationship to Pharaoh), there was no stable interiority (no concrete concept of an "I" able to oppose the idea of stability expressed by the Pharaonic state and its gigantic buildings erected by the people for their divine king). Egypt's pre-rational, verbal inclinations found their incipient archaeological expression in the Pyramid of Pharaoh Unis (ca. 2378 - 2348 BCE), the last king of the Vth Dynasty. He was the first to cover the walls of two chambers of his tomb with hieroglyphs. His successors did likewise. Together, these texts form the Pyramid Texts. In these literary "sayings" and discourses, the next cognitive mode (proto-rationality) is still absent. In these intricate recitative monumental spells in "record style", created to magically safeguard the dead Pharaoh "de opere operato", fluid (unstable) pre-concepts predominate. Indeed, a rudimentary grammar is at work, but no stable interiority is present. Nevertheless, any literary critique confirms their poetic power, verbal ingenuity and metaphysical depth. The focal point of subjective reference is always Pharaoh, as shown in the phenomenology of his ascension and arrival in heaven (cf. The Cannibal Hymn). He is the only one who, besides the deities, possessed a "bA", a soul or dynamic, efficient subjective principle. Very obvious are the considerable linguistic skills developed in manipulating the given approach. There are traces of a certain "mechanization" of writing (Breasted, 1972) as well. Both are indicative of a high cultural standard and considerable intellectual sophistication. Is it accidental, that all later Dynasties venerated the "archaic" master plan reflected in Pharaoh's conceptualizations of the afterlife ? The collapse of the Old Kingdom (ca. 2200 BCE) and the cognitive decentration it brought about (both economically, politically, theologically as morally), enabled the Egyptian mind to finally express proto-rational thought. With the son of Re eclipsed, the Egyptian was thrown upon himself and he or she had to realize a concrete, stable interiority or personal I-ness, sheltered by the immediate context of family, profession and nome. Instead of the Memphis-based Old Kingdom, provincial, family-based cultures rose. The contextuality of the nome allowed for a new awareness of one's identity (the commoner had a soul) and one's place in creation (personal virtue instead of allegiance to Pharaoh). The culture of these feudal nomarchs of the First Intermediate Period (ca. 2198 - 1938 BCE) shows the end of the Old Kingdom was not the end of Egyptian cultural assets. The latter were provincially redistributed, although the artistic level dropped. The "literature of despair" of the period proves (cf. Discourse of a Man with his Ba) how cultural decentration caused a new concrete focus of literary attention : the virtue of the individual (independent of Pharaoh). The sapiental instructions also evidence these changes. The rise of Middle Egyptian, as well as non-funerary Egyptian literature, provide clues as to the extent of the impact of the newly acquired proto-rationality. Because Egyptian civilization was proto-rational, does not imply nobody was able to think abstract thoughts, i.e. conceptualizations beyond the context of Egypt (as sum of all Upper and Lower nomes or provinces). The Maxims of Ptahhotep, the Hymn to the Aten as well as the Hymns to Amun (cf. the New Solar Theology of the New Kingdom) point in this direction. However, these thoughts were always embedded in an overall proto-rationality of context and multiple approaches, with its "old" mythical layers and pre-rational superstructures left intact, as well as its transformations and interiority, limited by geosentimentalities and local meanings. For more than two millenia, the Ancient Egyptians thought in a proto-rational way. The increase of coordinations formed coordinating systems & structures which were capable of becoming closed systems by virtue of a play of anticipative and retrospective constructions of thought (imaginal thought-forms). A practical system emerged and it remained in place until the end of Dynastic Egypt. However, under the Ptolemies, it had to confront Greek culture and its rationality. Hence, Egyptian religion was partly Hellenized (cf. Hermetism & the Corpus Hermeticum). Hebrew, Greek or Latin cultures did not cause the final closedown of Egypt's influence, but Christianity did, identifying its multiplicity of approaches (and variety of deities) with Pagan heresy. Nevertheless, the identification of Osiris-Pharaoh with Jesus the Christ, Pantokrator, and Isis with Mary, mother of Jesus and mother of God, lay before its doorsteps. Was the formation of Christian Orthodoxy (Trinitarism) influenced by Ancient Egyptian triune theologies ? Yes it was. Interpretative abstinence is an illusion, for scientists always use theories and mental connotations when they observe facts (cf. Rules, Knowledge, Postmodern Thought, Criticism). The antiquarian mentality of most egyptologists has not delivered a history of the development of mind in Ancient Egyptian culture, quite on the contrary. Specialization and detailed studies suggest an overall synthesis is unlikely to be achieved. Perhaps the methodology used is more responsible for this situation than the many Egyptian testimonies, clearly evidencing the importance of writing, language, recitation, prayer and a belief in the efficacy of words, hand in hand with a profound religious attitude dominating all areas of Ancient Egyptian life. Is it because these (outdated) positivists are often atheist, that egyptology remains in its collecting stage ? Is this seclusion not resulting in the closedown of egyptological departments ? How can one study beer if one is against alchohol and drunkenness ? Is it really important to know whether Pharaoh Ramesses II had red hair or not ? How to understand the role of deities if one denies the Divine ? Lies the proof of the pudding not in its tasting ? If archeology refuses to interprete the available data, then another discipline has to be called in. In this, philosophy is able to assist. In the first place, because the historical record contains philosophical themes (these are bound to arise when theological speculation is present). In the second place, because philosophy, especially metaphysics, tries to arrive at an overall picture based on a multi-disciplinary approach. Finally, epistemology provides the tools to a better understanding of ante-rationality. The consistent presence of philosophical themes as well as sapiental literature, makes the case for a study of Ancient Egyptian philosophy. 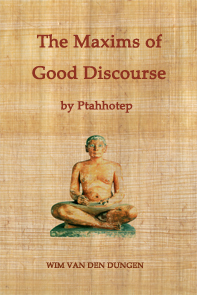 This is not a theoretical, abstract approach of being-as-such (as Greek metaphysics would be), but a speculative intrest which emerged in the context of confrontations between theological systems (especially tensions between Heliopolitan, Osirian, Memphite and Theban theologies), as well as in the phenomenology of despair and funerary preoccupations. What characteristics of Egyptian proto-rational thought played a prominent role in the constitution of Greek rationality & philosophy ? Egyptian rituals were a unity of gestures and words. The latter were vibrations opening the secret gates of the netherworld (or "Duat"), offerings of sound (voice-offerings) and subtle bodies for the deities to dwell in (as "kA" and/or "bA"). But ritual gestures were a "language" too. For example : two raised hands -the hieroglyph for "kA"- indicated embrace. Each morning, the cult-statue was likewise "embraced" by the officiating priest to pass on vital energy and to invite the deity to dwell in its statue. Although producing such a vast literary corpus, the Ancient Egyptians never reached the rational mode of cognition as a collective or integral part of their civilized standards. Egypt's attachment to the contextual and the local, as well as the special pictoral nature of the "sacred script", all point to an ante-rational mentality, rooted in the mythical (notions), pre-rational (pre-concepts) and proto-rational (concrete concepts) layers of early African cognition, still at work today (cf. the tribal systems, the power of the chief, the importance of protective gris-gris magic, ritual offerings in Ruanda, magical cannibalism in Congo, ritual sacrifice of witch-children etc). The study of this mentality is more than necessary. The first barrier to overcome, being the acceptance (from a rational, discursive vintage point) of the concrete "closure" established by proto-rationality. The fact the Greek word "nous" (mind, thinking, perceiving) would seem to be derived from the Egyptian "nw", "to see, look, perceive, observe", is noteworthy. 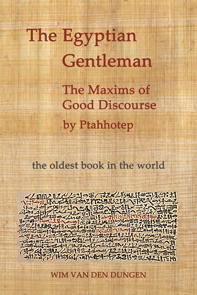 The "logoic" nature of Greek philosophy, as well as its preoccupation with "aletheia" or "truth", are thus linearizations of the Memphite philosophy to be found in both the work of Ptahhotep and the sapiental authors, as in the theology of the priests of Ptah. ► accomplished discourse : the fundamental categories of Memphite thought were "heart/ tongue/heart" insofar as theo-cosmology, logoism and magic were at hand and "hearing/listening/hearing" in moral, anthropological, didactical and political matters. The first category reflected the excellence of the active and outer (the father), the second the perfection of the passive and inner (the son). The active polarity was linked with Pharaoh's "Great Speech" ("Dd-wr"), which was an insightful ("siA") authoritative command ("Hw"), which no counter-force could stop thanks to its magic ("HkA"). The passive polarity was nursed by the intimacy of the teacher/pupil relationship, based on the subtle and far-reaching encounters of excellent discourse with a perfected hearing, i.e. true listening. The "locus" of Egyptian wisdom was this intimacy. Although Pharaoh was also called "wise", the sapiental discourses alone name their (possible) author. Wisdom was always linked with a "niche" defined by the vignettes of life the sage wished to use as good examples to confer his wisdom to posterity, to understand how he balanced truth and righteousness ("mAat") in all circumstances and made the social order endure by serving "the house of plenty" ("pr-aA"), being at peace with himself ("m Htp"). and the plummet of the balance, according to its stance !" Papyrus of Ani, Plate 3 - XXVIIIth Dynasty - the plummet as hieroglyph for "heart"
This exhortation summarizes the practice of wisdom and its persuit of truth found in Ancient Egypt. It also points to their practical wisdom, persuit of well-being and art of living happily & light-heartedly. Indeed, the outcome of the weighing is determined by the condition of the heart ("ib") or mentality alone. Also magic depended upon the heart, i.e. the mind. In the above sentence, the "practical method of truth" of the Ancient Egyptians springs to the fore, to wit : concentration, observation, quantification (analysis, spatiotemporal flow, measurement) & recording (fixating), with the sole purpose of rebalancing, reequilibrating & correcting concrete states of affairs, using the plumb-line of the various equilibria in which these actual aggregates of events are dynamically -scale-wise- involved, causing Maat (truth and justice, personified as the daughter of Re, equivalent with the Greek Themis, daughter of Zeus) to be done for them and their environments and the proper vital energy ("kA") -at peace with itself- to flow between all living parts of creation. multiplicity-in-oneness : the possibilities between every pair are measured by one standard (the plummet). 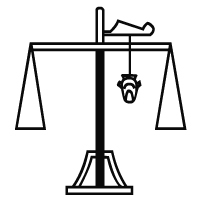 All dynamics between the scales will influence the position of the plummet, represented by the hieroglyph of the heart or "ib". The measurement of the differential between the scales is the "conscience" of every operation. If too far off limit, the plummet will record an unmeasurable quantity, and no precise calculation will be possible. In that case, the constant equilibration of multiplicity by oneness (setting its standard or set of limitations) is broken down and chaos has overtaken order. If, however, the right angle between plummet and beam approximates zero orb, then perfect balance is achieved, and oneness eliminates multiplicity (for two scales have balanced perfectly and no flow is achieved). The orb of the right angle determines the "truth" of the established equilibrium, which is always broken down by the ongoing influx of desequilibrium and chaos into the world of order. An honest person aims to preserve the balance of the balance. The following papers try to initiate such a philosophical study of Ancient Egyptian culture by investigating a number of philosophical themes on record. UNIS : the overpowering cannibalistic god and image of images.